HENRY THORNE. The Thornes were a mobile family, changing parishes with each generation. Henry was born in Bishop’s Tawton, married in Satterleigh to a girl from Warkleigh, and raised his family in Chittlehampton. These villages lie in an arc around the western side of South Molton in north Devon. The village lies two miles south of Barnstaple, on the broad lower reaches of the River Taw. It is six miles from Chittlehampton, where Henry raised his family, but the parish extends southward to meet Chittlehampton’s boundary, so the Thorne family could have lived much closer to their eventual home. The second possible baptism is in High Bray, only a little further away from Chittlehampton, but not adjacent to it. High Bray, as its name suggests, stands perched on top of a precipitous hill, where the River Bray flows down from Exmoor on its way to join the Taw. The parish extends up to the Somerset border. The argument against this is that a Henry Thorn married Mary Grimsheer, both of High Bray, in 1732. This leaves the Bishop’s Tawton baptism as the most likely one for Dorothy Davy’s husband in 1733. No evidence of an infant death or an alternative marriage has been found for this Henry. His mother was probably Mary Treble, who married Richard Thorn in South Molton in 1692. Only one sibling is recorded for certain. 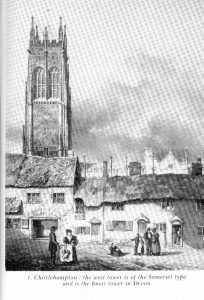 A sister Sarah was baptised in Bishops Tawton four years after Henry. But there are two earlier baptisms in nearby Warkleigh and Satterleigh which may be his brothers. The father is Richard Thorne, but the mother is not named. There is a 9-year gap between the first and second of these, which could mean there are more baptisms in a parish register not found. But there is more stability after Henry’s birth. 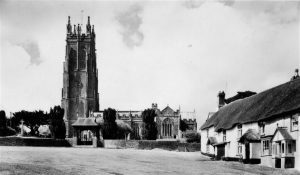 The family were in Bishops Tawton for at least five years.The frequent shifting of parishes suggest that Richard Thorne may have been an agricultural labourer, who changed his employment every year at the annual hiring fair, which probably took place at the market in South Molton. At some stage between his sister’s birth when he was four and his marriage at the age of 30 Henry moved to Chittlehampton. 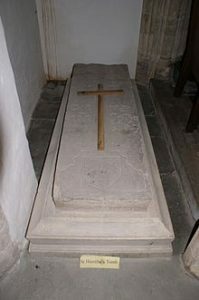 Since there are burials in Chittlehampton which may be his parents’ it is probable that the whole family moved there. There were many Thornes here, as in other North Devon parishes. Earlier that century Michael Thorne, Taylor, and Nathaniel Thorne, Mason, were raising families in Chittlehampton, suggesting a family tradition of craftwork rather than farming. But we do not know how closely they were related to Henry. The greater stability in his parents’ life may have been due to Richard Thorne gaining secure employment on a farm, or saving enough to rent a small amount of land and work this as a husbandman. Certainly Henry’s son William became a husbandman. This may have been Henry’s occupation too. Chittlehampton was once a famous pilgrimage site. It has a handsome church containing the tomb of St Urith (Latinised as Hierithra), to whom the church is dedicated. She was a Christian girl from North Devon who was murdered in the 7th century, traditionally beheaded with a scythe. Before the Reformation, the church grew rich on the offerings of many pilgrims. The present church, originating from the 15th century, has a magnificent tower, paid for by these offerings. The veneration of saints was suppressed in the Reformation of the 1530s. DOROTHY DAVY was born in the tiny village of Warkleigh, two miles from Chittlehampton. Her parents’ marriage has not been identified but we believe her mother’s name was Elizabeth. The following year the last Stuart monarch, Queen Anne, died. The Act of Succession had barred her half-brother, the Catholic Prince James, son of the deposed James II, from succeeding her. Instead, the first Hanoverian king, George I, came over from Germany to take the throne of the United Kingdom. A year later, 1715, Prince James, the ‘Old Pretender’, mounted an abortive invasion in an attempt to regain his father’s crown. He landed in Scotland, but was forced to flee again before his supporters could stage a coronation. He had some support from the Scots, but England remained solidly behind the Protestant German George I, even though he spoke little English and was only distantly related to Queen Anne. The people did not like him, and he did not like England, but they preferred him to the Catholic James Stuart. This 1715 rebellion revived the suspicion that Roman Catholics were Jacobite traitors. Dorothy’s is the only baptism found for this family in the Warkleigh registers, but there were other children who appear to have been born elsewhere. In one terrible summer, 1716, there are burials for James, the son of John Davy, Elizabeth his wife and Elizabeth his daughter. This suggests that John and Elizabeth had moved there from another parish. Dorothy was probably the couple’s youngest child. The death of three of the family within a month of each other suggests an infectious illness, but three-year-old Dorothy survived it. Five years later, Agnes, daughter of John Davy, also died. This John Davy was said to be of Chittlehampton. The family may have moved across the parish boundary since Dorothy’s birth, but still found it convenient to use Warkleigh church. When Dorothy married, Warkleigh was still her official parish of settlement, but the wedding took place in Satterleigh, only 1½ miles away. These two small parishes were later combined into one. Dorothy was 20. This was young for a bride from the farming or labouring class. Henry was 30. But there is no evidence that the marriage was precipitated because Dorothy was pregnant. Their first known child was born more than two years later. They had eight children baptised in Chittlehampton. None of these children seems to have died in infancy. This was also true of their son William’s family of seven, an unusually healthy record for the times. It suggests that they were not one of the poorest families. When Henry and Dorothy were raising their family, the Protestant ascendancy was again challenged. In the second Jacobite rebellion of 1745, the ‘Young Pretender’, Charles Stuart, landed in Scotland, as his father James had done in 1715. His success would have brought a Catholic king back to the throne. This time the Jacobite forces reached Derby before they turned back. The rule of the Protestant Hanoverian kings was secured. The Thornes’ eldest son, William, moved on to the neighbouring parish of Filleigh, where he farmed as a husbandman and raised his family. Henry stayed on in Chittlehampton. He died there in 1763, when he was 60.